It’s rare to find an activity that increases muscular strength and cardiovascular fitness at the same time. Luckily, most martial arts accomplish both at once! Brazilian jiu-jitsu, for example, involves a lot of grappling with a partner, which tests the strength of every major muscle group in your body while increasing your heart rate. It’s never good to overdo it when you’re working out, but there are some people who should approach exercise a bit more cautiously. Children and the elderly shouldn’t attempt exercises that may be too intense, as their bodies can’t handle as much stress. The same is true of pregnant women. That said, there’s no reason these groups of individuals can’t maintain some level of fitness. There are plenty of martial arts forms that are not very physically taxing, like Tai Chi for instance. Instead of relying on explosive movements in the workout, Tai Chi emphasizes proper breathing patterns while working through slower motions. It’s as much a meditation as it is a workout. Although it’s not technically a muscle, your brain is an important part of your body. Why not keep it in good shape, too? Research has shown that, like a muscle, your brain actually gets stronger the more you use it, according to the Khan Academy. Martial arts are sports that require you to think as much as you act. You can work your brain out plenty as you remember the various patterns and combinations associated with forms and self-defense maneuvers. 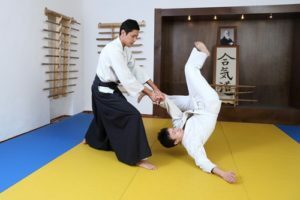 Not only will you get the full benefit of working out regularly, the motions that you practice in martial arts are excellent techniques for self-defense. You should feel a little safer the next time you walk home alone at night, knowing that you could defend yourself if necessary. That feeling of safety and security will only increase the more you practice.